The Nexus 6 was announced 10 weeks ago by Google and here in Australia it is still a rarity. It is available at JB Hifi and some Good Guys stores if you are lucky. I can tell you from experience that it can be difficult to find one not already reserved. We have all watched our comrades from the US post shots of the newest Nexus device in their possession. We have seen blogs based in the US publish their reviews on the Nexus 6, some flattering, most not so much. I got tired of everyone else’s opinion, and although I have a 64GB Nexus 6 on order from Yatango, I bit the bullet and shelled out close to $900 for my own Nexus 6 to make up my own mind about it. The difference with my review is that it will include mods/tweaks/hacks etc, a big reason why many buy a Nexus device. If first impressions really are anything to go by, the Nexus 6 is an amazing phone. The minimalistic design of the front with symmetrical stereo speakers on the top and bottom make for a stunning-looking phone. Hidden in the speaker grill at the top of the device is the low battery LED which you will very rarely see, unless you obtain root access and use a custom kernel (check back later for this hack). Combine the minimalistic front face with the curved, stylish back of the phone and you have a great looking phone. The back of the phone has the usual Nexus name written along the centre, along with the same Motorola dimple that is present on the Moto X below the camera aperture. The camera aperture is surrounded by the ring housing the dual flash LED. The curvature of the back lends itself to sitting in the hand nicely without any harsh corners. The back of the device looks great but it’s texture (or lack thereof) leaves a lot to be desired. I had the OnePlus One black edition for 6 months and not once did I worry about dropping it due to the sand paper texture of the back cover. After owning the Nexus 6 for two weeks now there is rarely a single minute where I am not concerned about the largest phone I have ever owned sliding out from my grasp and kissing the floor. Unfortunately this is something the user is stuck with unless they decide to make a big phone even bigger by adding a case (see below) or by changing the colour of the device and applying a skin such as those from dbrand or Slickwraps. The volume rocker and power button are located along the right hand side of the phone, very close together. They are also located close to the centre of the device allowing for ease of use when holding the phone with one hand. While the buttons are close together, without any case on it, the buttons are easily distinguished from each other because the power button has a texture on it. Having said that I have on several occasions turned the screen off while intending to adjust the volume. The nano sim slot is located on the top of the device along with the headphone jack. The top of the device has a curve to it as it blends into the back cover which is a trait of the Motorola 2014 device family lending weight to the rumour that the Nexus 6 was originally intended to be an Android Silver device and not a Nexus. When looking at the Nexus 6 it does appear to be essentially a blown up, stretched out Moto X with them sharing more than just the looks. Underneath this pretty exterior is nothing revolutionary, nothing fancy but also very little lacking, what you would expect from a company’s flagship phone of 2014. The Nexus 6 packs the same processor as many other flagship devices, a quad-core Qualcomm Snapdragon 805, clocked at 2.7GHz with an Adreno 420 GPU. Combined with the 3GB of RAM alongside a pure stock Android OS the CPU runs like butter most of the time. At times there were small slowdowns when accessing the recents menu in it propagating. Whether this is due to the new way Google/Android does this by keeping all opened apps in there basically forever or not is unknown at this stage but it was a very minor annoyance. In other words the apps need to be updated to run all the new hardware and new runtimes etc. This is the downside of basically rewriting Android. We have a whole new runtime, ART, and this seems to be creating issues with some developers and their apps. In time I think these developers will fix their apps but most likely Google will need to release an update or three to fix a few issues themselves. The Nexus 6 is available in both white and midnight blue and 32GB and 64GB although the 64GB is yet to be sighted in an Australian variant. It is meant to be coming but for now if you want to purchase it you will have to settle for the 32GB version. The Nexus 6 is a big device. At 159.3mm long and 83mm wide it is certainly a struggle to hold and use one handed. In fact I’d say don’t even bother. Of course a device that big is going to be a decent weight by the time you consider the amount of glass etc is in the display. At 184grams it is 8 grams heavier than the similarly-sized Samsung Note 4 but the build on the Nexus 6 feels a lot more solid than the Note 4. The back may be plastic but it feels solid. There is no give in the back plate and the entire device feels strong and sturdy. Some may not like the plastic back but with a device this size a non-plastic back may result in an extremely heavy and possibly unusable device. My gripe is with, as stated above, the texture on the back. I think if Google/Motorola had included some kind of texture on the back, such as the fine grain sandpaper-type feel of the black OnePlus One, it may have given the device more of a premium feel to the touch. Personally I will be purchasing some of the skins from the links above, apparently they can be reused after being removed carefully. The Nexus 6 display is a big, vibrant 5.96in AMOLED display with a resolution of 1440 x 2560 pixels resulting in a pixel density of 493ppi. Retina display eat your heart out. With a resolution this high one would expect the CPU to struggle but it worked well throughout the OS, at least on a par with the OnePlus One running a lower resolution display with a similar processor. The display is a pleasure to read and interact with. The type on the browser was crisp and easy to read. I’ve never experienced a display with this resolution before for more than an hour or so but I can say that when people state that you don’t need any more than 1080p in a mobile display have not experienced a decent 2k display. By itself it may not make much difference but a few years ago people were probably saying that about 1080p TVs. If the technology is there I say why not, as long as there isn’t much of a hit when it comes to battery and CPU usage. I have seen some reviews saying that the display was not bright enough. I am yet to experience that at all. I rarely use my device over half screen brightness but in the bright sun down at the beach I had no issues reading the screen. Other reviews have talked about how the display has a red tinge to it and I have to say that I did experience that, only when adaptive brightness was checked. The display only went that dark when in a dark room so it didn’t affect my interaction with the device. In a nutshell the display is big and beautiful. Some may say the colours are not true colour representation but on it’s own, to the average punter, it is a great display that makes the device a pleasure to use. Hopefully the developers of the Android world can work on calibrating the display to give a more accurate representation in the coming months. Google and Motorola say that the 3220 mAh battery will last up to 24 hours talk time and 10 hours of internet use time while on LTE. Far be it from me to call these bigwigs out but I do have to call BS on this one. There is no way I can get that much on this phone. I can barely get 12 hours usage (having is on with moderate usage), let alone 10 hours of surfing the web. For a phone with such a big display at such a high resolution 3220mAh is definitely not a big enough battery. I can get close to 12-14hours battery life on this phone but I expect and want better. It’s a big phone, stick a big battery in it. The saving grace is the Qi charging and the turbo charging capabilities. Those who have used Qi charging before will know how handy it is and easy it is to charge your phone by just placing it down. It’s not hard to have a charger sitting on the desk at work etc. Turbo charging helps this even more. With only 15 minutes of turbo charging you can get an extra 6 hours of usage. I have no doubt someone will be able to eventually convert this into a car and portable charger just like Oppo did with their VOCC charging making it even more convenient, it’s just a shame that it is required. We can only hope that the battery life will improve as Lollipop matures. After my first Nexus 6 has a faulty OIS causing non-stop shaking of the camera and thus blurry images I was not thinking kind thoughts about the Nexus 6 camera. After having my Nexus 6 replaced I have replaced the unkind thoughts with some of apathy and disappointment. We all thought that Google, with the release of new camera APIs would have an amazing new camera on their own flagship. We were wrong. The camera is ok. It is slow to focus and take a picture. It is slow to open and the shortcut from the lockscreen to it is clumsy and difficult to repeat at best. An example of this occurred last night when I took my kids to the BigBash cricket. The Renegades scored a six and the kids were happy and holding up their six signs. I tried to open the camera from the lockscreen, nothing. Did it the normal way by unlocking phone first. By the time the camera was open they were just about one and by the time it had focused and taken the picture they were sitting down. Moment lost. What happened to the lightning fast camera they released with the Nexus 5? When you have a nice still subject to photography the camera performs very well but except for my car all my photos are of my kids and they rarely sit still. The colours it produces are vibrant and seem to be good representations of the subject. The low light performance is really good and a definite improvement over the Nexus 5, but that’s not hard. If you want a phone with an outstanding camera unfortunately the Nexus 6 is not one that I can recommend at this time. Last year Google issued several updates for the Nexus 5 camera, improving it immensely. We can only hope that they do the same for the Nexus 6. The Nexus 6 camera is serviceable but not outstanding. The Nexus 6 has connectivity galore. It will connect to the HSDPA bands 800/850/900/1700/1800/1900/2100 and the LTE bands 1,3,5,7,8,9,19,20,28,41. The HSDPA will connect up to 42,2Mbps and the LTE is the Cat6 variety and capable of speeds 300/50 Mbps. I work in an x-ray department where there are a lot of lead walls and faraday cages to interfere with the signal and I hear the other staff complaining a lot about having little to no signal in the department. With the Nexus 6 I have not noticed any issue at all with having a minimum of HSDPA and normally LTE at all times. The phone reception while in a call is great throughout for me as well. The WLAN support is for 802.11 a/b/g/n/ac, dual-band, with the usual Wi-Fi Direct, DLNA, and Wifi hotspot. I can connect to my router to each band without any issues although I do not have an ac router to test that. Some users have noted Wifi issues but I have not noticed any using a basic Optus-supplied wireless router. Bluetooth v4.1 support is inherent bringing with it A2DP and LE as you would expect with Android Wear taking off. Of course there is NFC support as well. Front facing speakers are becoming very popular with manufacturers lately and I can now see why. The dual stereo speakers located at the bottom and top of the display are loud, clear and actually have decent low end sound. It’s still not at the Boom Sound level but these are extremely adequate. The headset volume is very low as I noted in my first impressions post but it is clear and crisp. Everyone is doing decent audio these days and Motorola have done the same here. The sound through my bluetooth headphones is great as well. No issues at all with the sound on this phone although in the future I’d like to see Google do a bit more with the sound. I’d like to see a more advanced equaliser such as Viper Audio. Maybe they can bring an API for it in the future but at the moment their audio equaliser is very lacking. I was asked after my first impressions post if there was any lag and I answered in the negative. Unfortunately there are times where it is not as snappy as you would expect from a modern flagship. Whether this is due to the memory leak bug (which has incidentally been fixed in AOSP and is noticeable in custom ROMs), the extreme amount of apps continually present in the recent apps, the new ART runtime or the buggyness of some apps due to poor coding (apparently some are not updated to Lollipop very well and updating from the Play Store results in slowdowns but a clean install can fix it) I am not sure but considering it is early days for not only the Nexus 6 but also for Lollipop I would expect this is improve considerably in the coming months. As it is the phone is still a very responsive phone and can easily hold it’s own with a Note 4 when it comes to the speed when navigating through it. As I said before it is a Nexus so the OS is light and easily navigated. The ability to multi-task and play all games fluidly is what you expect from a Nexus and I was not disappointed. In case you hadn’t heard, the Nexus 6 is the first phone to come with Lollipop out of the box. I’m sure you are all sick of hearing about Lollipop and all that it brings to the Android landscape. Instead of reiterating that which has been discussed ad nauseam I’ll just make mention of my favourite features mostly specific to the Nexus 6. The first feature is ambient display. Ambient display is when the display wakes up when it receives a notification and shows this. It does it when the notification arrives and also when the phone is picked up. It is an extremely elegant way to display notifications but if you are not around when that notification arrives how will you know to pick it up to check? Combined with an RGB LED notification light this would be a killer feature. That is a nice segue into my favourite hack on the Nexus 6. This involves altering a system file to turn on the LED that is present behind the speaker grill at the top of the device. This can be done just by flashing a custom kernel that supports it and then controlled using LightFlow. The notification LED can then be set for any app that sends a notification to the status bar and while the colours aren’t limitless there are a few to choose from. I still wonder why Google didn’t implement this feature, as they have in previous Nexus phones. It works great with ambient display. I walk in, see my phone has a notification due to the LED colour showing, pick up phone and the notification automatically displays on the phone and I can go straight to it and start interacting with the app. The lockscreen implementation is different to that which I have seen in some AOSP versions. The AOSP versions I have seen have had more options to hide the notification from the lockscreen without removing it from the status bar. I have to say I prefer the custom ROM implementation. Whether Google will bring this in future versions is unknown but they have been known to use UI changes that the developer community tests first. Another thing that didn’t make it into the final Nexus 6 build from Google was double tap to wake (DT2W). It was in an early build but was removed by Google in September for reasons unknown. It was easily reinstated by the clever developers at XDA in several ways. You can change a single system file, install and use an app from XDA and the Play Store or to install a custom kernel. Most custom kernels on XDA will include D2TW plus the LED light control. All of the above options require root access. Heads up notifications is another place where Google have sort of done well. This is where a notification pops up infront of whatever you are doing, showing you a quick glimpse of it. I like the idea of heads up notifications but I hate how you have little control over them. Google’s implementation of it is very basic, kind of a building block that developers can build on. Personally I have turned them off. Instead I have installed the app Floatify which can turn off Google’s heads up notification and display it’s own instead. They are customisable and can be interacted with. You can set it so that a swipe to the left will dismiss it from the notification bar while a swipe to the right will just dismiss it out of the way. A double tap can be set to open the app and a single tap can expand the notification. These and others can be changed around to whatever you want. There is a limited free version or a full paid version. I always thought that the “always listening” feature was a bit of a gimmick. Not any more. I use the always listening feature to give commands to my phone all the time. Get out of the shower in the morning “OK GOOGLE, what is the time?” and it speaks the time for me (followed by a swear word and me rushing). 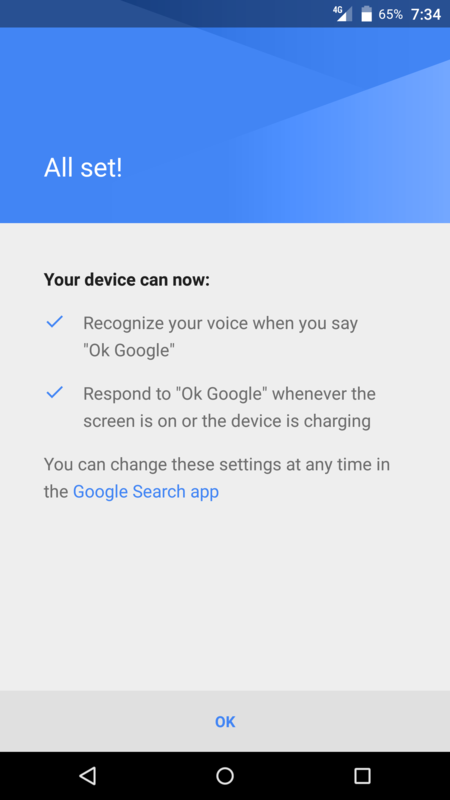 I have of course extended this by using the app AutoVoice combined with Tasker so that any OK GOOGLE can be used to run any type of command on your device. The app recognises a pre-determined command and then sends that to Tasker to run that command. For example I have it set so that when I arrive at the gym I say (in my car) “OK GOOGLE anytime fitness” and it sets the bluetooth to on if it isn’t already on, opens up my music app and gym program app and sets the volumes of each noise to a desired level automatically. Of course, now with always listening I don’t have to turn the display on for my phone to recognise this command. If you want to get the most out of this you will need to buy the paid unlock key for AutoVoice. Hopefully many more devices include this always listening feature in the future. The last software feature I will mention is device encryption. Early on, developers discovered that by changing a single flag in the boot image of the Nexus 6 will allow them to unencrypt them. This resulted in much faster read-write speeds when subjected to benchmark apps. It turns out that in real world use there is very little difference between the two. Some custom kernel developers have figured out how to increase these read-write speeds without unencrypting the device but either way there does not seem to be much difference between the two for most users. Ever since Google decoupled all their apps buying a Nexus device doesn’t offer much in the way of extra software that you couldn’t get from the Play Store. The Nexus devices are meant to be developer devices, for developers to build upon but personally I would like to see Google start to develop a bit of software specifically for their Nexus devices. Show the developers the direction they want them to head. Give them the basic building blocks of apps and ideas that can then be built upon. Unfortunately this is one place I think the Note 4 has it over the Nexus 6, accessibility. The Nexus 6 is a bloody big phone and as such is very hard to reach the entire display but Google have not included anything to aid this navigation of their behemoth of a phone. Other manufacturers offer different ideas to help people navigate large displays but Google has nothing. Maybe Google could build such things into AOSP, especially with larger phones becoming the norm. Of course for those of us in the know we can install apps to help with this. I use Pie Control of which there is a free and paid version but there is also LMT from XDA which has a lot more options but requires root access. Another useful app I am using to get around the OS of such a large device is Side Control allowing me to set hotspots on the edges of the device to a mini quick launcher. These two apps make the phone shrink in size when it comes to everyday use. The time of the phablet is now. Everyone is doing it. Most people who use a phablet for an extended period of time find it tough to return to a more traditionally-sized phone. There is certainly something to be said for that extra screen real estate. As such, Google have built their first phablet in the Nexus 6. To help developers develop apps for phablets. The Nexus 6 is a great looking device that sits well in the hand but is let down by the lack of texture on the back, making the Nexus 6 one small miss-step away from slipping to a quick and painful death on the floor. The display on the Nexus 6 is just amazing. It is bright and vibrant and big and when combined with it’s resolution of 1440 x 2560 pixels makes it a pleasure to read anything and everything on the phone. Whether it would look the same to the naked eye with a 1080p resolution is debatable but I can say that the display is a pleasure to use and Motorola have done a good job with it. With the Nexus 6 you get basic stock Google Android with no frills, no bloatware and no gimmicks. As I said it is basic and if you are new to Android you may find it hard to discover apps to help you extend the phone to it’s potential but a few simple Google searches can help you immensely. Google need to do something about this in my opinion. They have made a phablet that is extremely large, how about starting the developers on some software to aid the users in navigating it? In saying that, Android has come to the mainstream with Lollipop. It is bright, classy, beautiful and a pleasure to use. In the end I am extremely happy with the Nexus 6, and while it is not the cheap price of some previous Nexus devices I have to say it is well worth the money. Priced at a level similar to other flagship devices the Nexus 6 well and truly holds it’s own and surpasses in many areas. I would recommend it to anyone looking for a high end device. It may be big but you will get used to the size quickly and you will then start to wonder how you ever survived without a phablet. Out of interest, is “always listening” a feature of Lollipop or the device itself? When my LG G2 eventually gets Lollipop will it then have “always listening”? Funny you had a camera issue, so did I. Camera would only open as front facing. No issues so far with my replacement phone. Unlocked bootloader and rooted within the first couple days and been running custom ROMs and kernels since. Love this phone. Also picked up a couple slim cases to help with grip… minimal protection but not much added bulk. Tempered glass and I’m set..
You said this is hard to get, i found one available in two minutes from the Google play store, just have to look. Is that like the Android 5 “feature” of defaulting back to mobile data when your wifi connection internet speed isn’t fast enough or maybe down. No matter that you may want to access resources on your network Lollipop decides it will make the change and you have no say. It is fun when you can’t control your lights, Kodi, music etc because the ISP is down and Android has killed your wifi connection. great review very accurate based on my experience a few weeks into N6. don’t find it at all big actually small given before that was on Z Ultra preceded by Note2 and Galaxy Nexus. Pity about camera tho HDR mode and Manual Camera app for motion shots better! The 64GB was available. I have on in my hands now. Purchased it from the Google Play Store 2 weeks ago. Hey Scott, good job on the review. Apologies if I missed this above, but have you experimented with the Double tap to wake functionality? I’ve had the Nexus 6 for over a month now (purchased from JB Hifi, QLD), and it doens’t have this feature. You can, root the device and get it working (and the LED notifcation light too! ), but I haven’t used it. Yes I have and it is awesome. Along with the led light. Why google didn’t add double tap to wake I don’t know. How is Turbo charging a “pro” when none of the AU models shipped with the turbo charger? It’s a pro because it will be here soon and the ability to get 6hrs extra use from only 15min or charging cannot be anything but a pro imo. I also ordered one from Amazon that will be here in a day or 2. You can order one free from Motorola within 6 months of purchase. IIRC that was actually mentioned in the most recent, or the one prior, of the Ausdroid Podcasts. The problem isn’t the phone having the turbo charge capability. It’s that the chargers themselves are not yet being made to AU electricity standards. So as soon as the chargers are made to suit AU power standards, turbo charging will work on any existing AU bought N6.